Does Your Technology Make Working Remotely Difficult? Nobody likes coming back from a business trip or a vacation only to be bombarded with catch-up work when they return to the office. Or how about arriving to a meeting only to realize that your important documents are still back at the office? Not having the data you need, when you need it is frustrating! If you’re still messing with paper documents or storing data on your desktop or physical device, you’re not getting the most out of your technology. 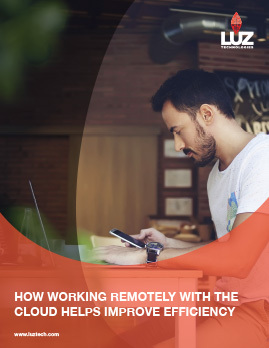 LUZ can help you gain the freedom to work remotely by migrating your data to the cloud. With the cloud, you’re able to access your data anytime, anywhere, and on any Internet-ready device. Discover how migrating to the Cloud can improve your company’s efficiency and productivity. Start experiencing the freedom to work remotely. Contact LUZ today.